Stop by Karma (510 E. Route 83, Mundelein, Ill.) after 5 p.m. this week, Sept. 16-20, for a culinary journey through Asia guided by Executive Chef Robert Packer. These specials are offered in addition to the restaurant's regular menu, which showcases different dishes and styles from Asia. Begin with a Roasted Asian Pear Salad on mesclun greens, dressed in balsamic soy vinaigrette, topped with candied walnuts ($10). For the special entree of the week, indulge in Tempura Jumbo Prawns with a chipotle creme, jasmine rice and baby bok choy ($22). Finish off by treating your sweet tooth with desert, Pomegranate Panna Cotta with macerated berries ($7). 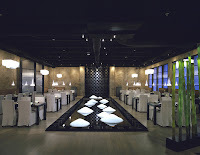 Reservations are recommended, and can be made by calling Karma at (847)970-6900.